Katja Millay's writing is beautiful. It manages to both linger and compel you to push on. 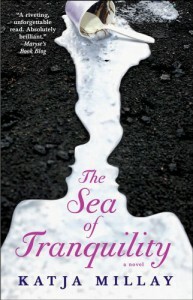 The connection to the sea of tranquillity title namesake is gorgeous and so is much of the imagery and metaphors. I love dark, angsty literature and this book truly left me satisfied and feeling miserable in that good way. The alternating point of views felt like a ride on a see-saw; sometimes fun, sometimes bumpy but a ride nonetheless. Nastya and Josh are damaged kids, but endearing so that you're rooting for them right from the beginning. *sigh* and Josh; it's been a long time since a fictional guy made me swoon, maybe not since Darcy but Josh has style. Sometimes stories romance stories revolve around two people almost trapped in a bubble, but here Katja Millay creates a well rounded supporting cast to the protagonists that are just as enchanting. More than anything I love that this book is about healing, not the damage. It shows us that healing is a slow process, and that it doesn't come instantly after a single confession, that's just part of the process. This book is truly captivating.